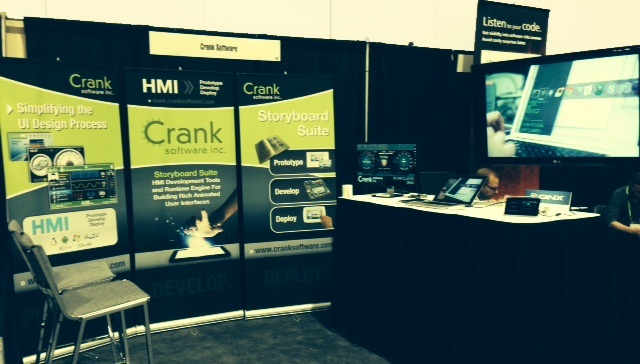 Crank was on the exhibition floor at Telematics Detroit 2014. The event was abuzz with conversations around design innovations, safety in infotainment, life/car integration and more. And let's not leave out IoT. The "Internet of Things" is bound to come up once or twice with car connectivity a topic at the forefront. Also, if you visited the TI booth, you were able to check out the demos of Storyboard on QNX and a Green Hills Software INTEGRITY cluster. The fact that we're showcased on so many operating systems and hardware devices really speaks to Storyboard's portability. Download a free 30 day evaluation of a fully functional version of Storyboard Suite now.